How can other cultures influence the music we make? Musicians are called to be inquisitive, creative, and collaborative artists. 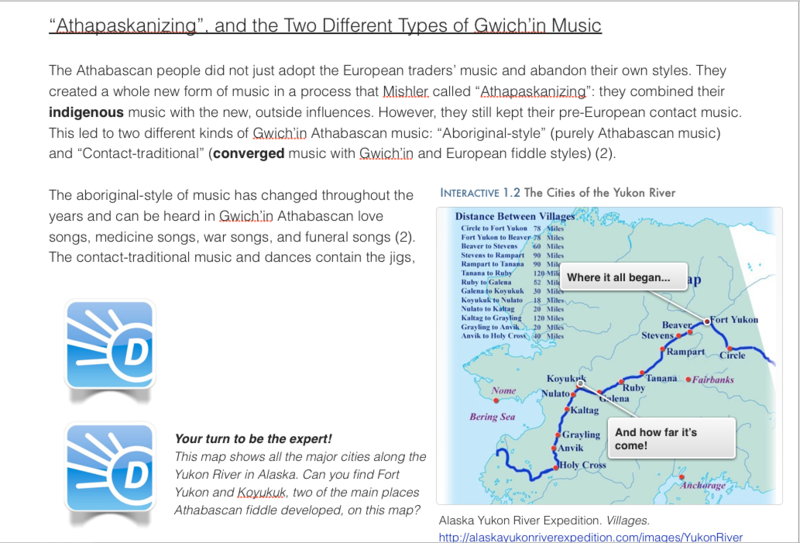 This lesson plan invites my orchestra students to view themselves in this way as they explore Athabascan music and how it has been influence by other cultures. Students will see a tangible example of how Athabascan music evolved into what it is today through various influences, and students will also be asked to reflect on their own musical influences through activities and discussions. Check out the sample of my iBook section that is my featured image above, as well as my lesson plan document that is attached! Awesome, Ruth! Like Lindsey, I can tell you have worked hard.. and had some practice at this! I like the design and thanks for all of the introduction info. I need to add some of that to my lesson….. This turned out terrific Ruth! I love the dictionary feature you put together and the interactive map. I want to learn this lesson right now. It looks fun. Nice job! Ruth, I’ve really enjoyed watching the development of your lesson in its visual format, and I really like your idea for experiencing the concept as an orchestra, as that is something we struggle with! I think you could expand your idea to include a song they are playing in orchestra, such as an exercise in Essential Elements that they’ve memorized. Good work! Such a great idea! Cultural influences go both ways. I think this lesson could be expanded even further to take into account any musical influences that the Athabascans passed onto western music as well. Ooo cool; I like the idea! This is so cool Ruth! I had vaguely heard about Athabaskan fiddle music from Fairbanks friends but I know nothing about it. I can’t wait to learn. I love what a highway of culture the Yukon has been throughout the millennia. There is always something new to learn about it! Side-note: I was sitting with Mr. Katzeek tonight and he started talking about how he had an idea for a classical instrument rendition of a traditional Tlingit song. This was while you guys were playing. He even started humming it for us. You guys should talk to him and see if he is interested in pursuing it further. Maybe you could help out!